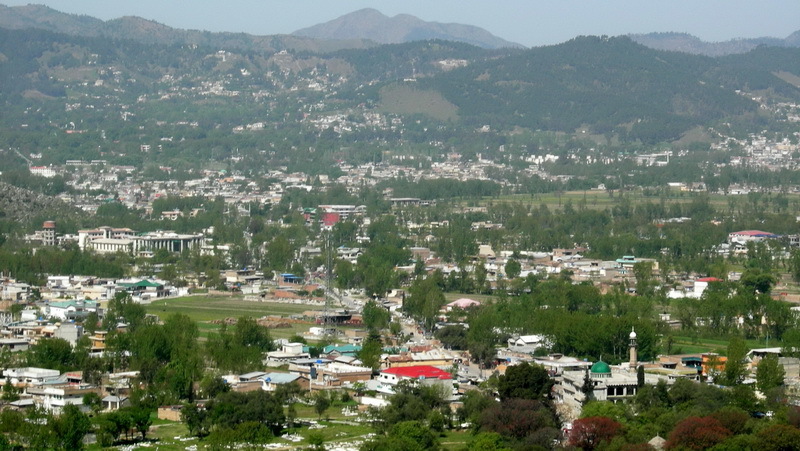 Abbottabad | The Delirious Outbursts! And this time around it was just not a hike. What spiced up all the fun was what followed shortly. On our way back to Abbottabad from Nathiagali we took the new partially completed alternate road being laid. 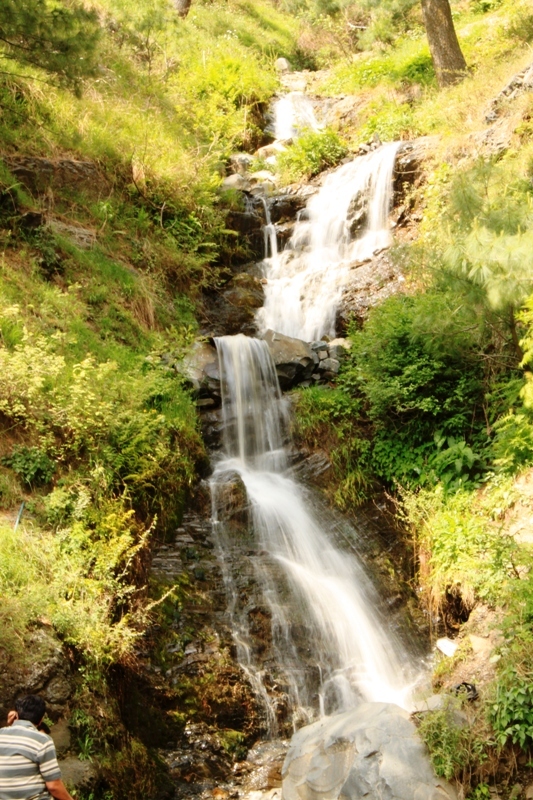 On its winding course it leads to a lovely water fall locally known as ‘Aab Shaar’. The narrow road bisects the thick heavens of pine jungles unveiling the idyllic beauty of the mountains, villages and lush green fields. Permeating raw beauty and purity that suffused the environs reminded me of the childhood trips on now much developed and commercialized Nathiagali Abbottabad road being brutally stripped of its natural treasures. Guess what! The best part is yet to come. Upon his insistence, we decided to stop at the native village of one of our mates near Bagnotar who was accompanying us on the trip. 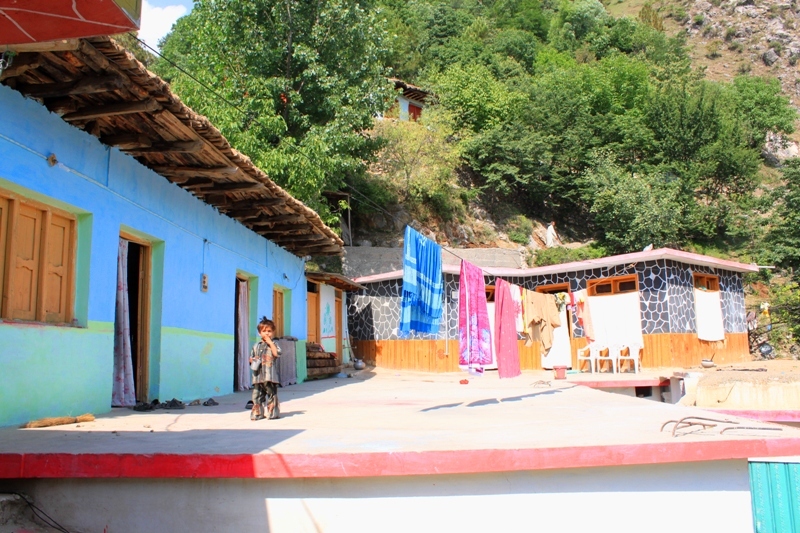 As it turned out, the lovely mountain village perched on top of a hill sat romantically across a hundreds of meters wide and at least one thousand feet deep ravine. 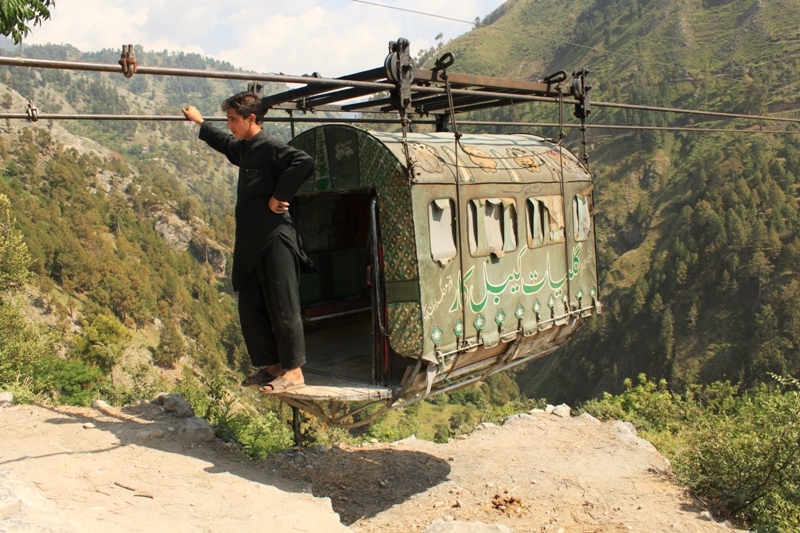 The only alternate access, other then crossing the stream on foot, is rendered by means of an innovative generator operated cable car look-alike installed by one of the domestic investors. Just like the sighting of the Eid crescent ,the instantaneous sighting of the queer conveyance gadget without appropriate warning triggered a couple of immediate in volunteered reactions. As expected, I went berserk with thrill and excitement, adrenaline pumping high. To an equal or even greater disappointment, the mates refused to take the risk of the ride. It took the best of my negotiations and motivational skills, some oratory, eloquence and rhetoric, rich incentives and good emphatic fifteen minutes of coaxing to finally win all the votes if not hearts. The ride, eventually proved to be much fun. No less thrilling than the cable car ride to Santusa islands from Mount Faber in Singapore or a long delightful ride to Genting heights near Kaulalampur. 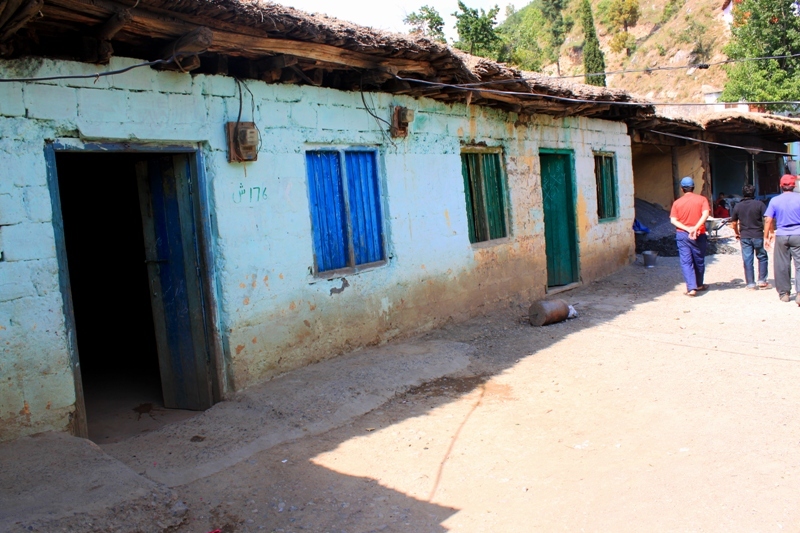 The village was a blend of colours , revealing a glimpse of gay rustic lifestyle and culture with increasing infiltration of modernization and urbanization. 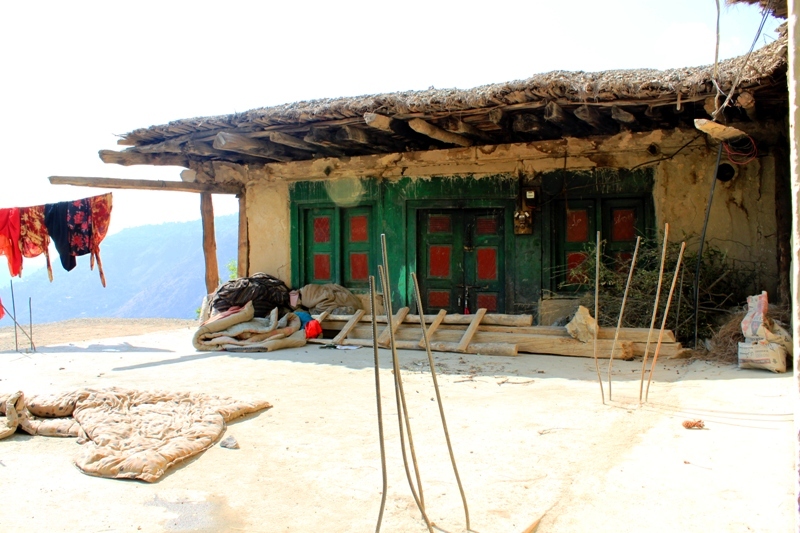 Adobe houses are paving way for concrete construction, the slanting tin and asbestos roofs being ruthlessly replaced by flat roofs. The arenas are getting bigger and wider whereas the households are shrinking to smaller numbers progressively diminishing the sense of sharing in all probability. The simplicity and naivety is losing its irresistible spontaneity, although the exemplary hospitality, warmth and open heartedness prevails and I sincerely hope it lasts as it steadily has for centuries. Osama Bin Laden is dead and the world is celebrating. Why not? The biggest terrorist on the planet and most wanted and spiteful scalp in this Holy Global War Against Terror has been claimed and consigned to where he belonged. That spells an end to a dark era and extinction of all the misery and terrorism from the face of the globe. World abruptly turns into a much safer & peaceful heaven to live in. Congrats! The condemned soul or his ghost has dissolved into thin air or depth of oceans where it was dumped in much haste. Why? For the reasons best known to the captives but that is perhaps not important and pointless. What is important is to know that the myth or creation had approached its imminent shelf life. Nothing lasts for ever and every product is launched with an expiry date. As Robert Fisk sagely asserts, following the wave of insurgence and awakening in the Middle East and Arab world, Bin Laden had lost all relevance. A ghost or a pawn that was created on the global chess board during the American war in Afghanistan by the agencies in the eighties continued to play according to a game plan. The puppet took the centre stage and limelight and entertained the audience world over as long as it was effective and meaningful. Invisible hands kept pulling the strings smartly and the absorbing show and act carried on until the dynamics began to change. In business terms, the product had completed its total useful life and was on its way to turning obsolete. And that’s exactly how we deal with an obsolete object. It is ultimately dumped and gotten rid of upon its expiry. The man who had eluded the entire global intelligentsia laced with endless resources and information tools, equipped with surveillance systems that can penetrate and hunt down a needle or even its shadow or impression miles beneath the crest of the earth, for some unknown reason, took ten years to be traced and killed. But why the hell of all the places in the world in Abbottabad? If it had to be Pakistan, perhaps it would’ve made some sense had he been dug out of some rocky caves in deserted Baluchistan or tribal belt; Or if he was captured from the stony expanse of Kohistan or even for that matter from the shadow or base of some of sky rocketing peaks in Gilgit or Baltistan. But as the luck would have it, it happened to be a most peaceful, serene, blooming, progressive and developing hill station; And above all home to the Pakistan Military Academy_ the training school of all the under commissioned army officers_ and a cantonment having significant military presence in the form FF and Baluch regimental centers. Is that just a mere coincidence!? Like the rest of the world, as the fast paced events quickly unfolded, our government and foreign office was completely dumbfounded caught in utter shock and disbelief. For hours there came no official statement and when eventually it was issued, it was highly vague as expected. What is even more notable is that US president, Obama, in his statement specifically congratulated American forces and people without even slightest of mention of Pakistan or its co_operation. What is being regarded as a major diplomatic setback and failure, with a bit of cynicism, can be seen in a different light. Does that allude to a major policy shift on behalf of US in a new paradigm where Pakistan is being conveniently dumped or worse portrayed as a villain in the game? I sincerely hope not! Isn’t it so true and sums it all up so befittingly? Whatever happened, we should be pleased about Osama’s elimination as it terminated and permanently closed a bleak and deplorable chapter from the books of history. But wait a moment. What did the Saddam’s extermination lead Iraq into? If I think upon the similar lines, is that what is apparently visible just a twist in the fairy tale, a sinister beginning or a tip of the ice berg?